Are you throwing a spooky Halloween Party this year? Then think about the front of your house or apt - you need to set the scary mood. Candles hanging from trees, spooky music and maybe a fog machine. Use these spider stands from Lillian Vernon either on your door stop or right in the foyer. Another idea is to use mini pumpkins as a dip holder - just carve out the center and voila. 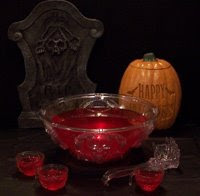 Don't forget the restroom decor - Fill a glass container with candy corn and top with a candle. Carve out some pumpkins and set around your table or bar. You should have a black and white candy bar set up. Don't forget little bags for guests to go Trick or Treating before they leave. Keep reading throughout October for some more Halloween Fun.